As The RSPB undertakes the annual task of working out what species are enjoying visiting our gardens following the Big Garden Birdwatch it is worth remembering that birds are a wonderful part of nature. While some species may be known more for being pests, there are many others that need protecting and need our help to survive. In fact protection from ‘pest birds’ is something that will help these other species to thrive. The best approach is to think of your garden as a mini eco-culture that will attract all sorts of wildlife. Put out bird food – this is the most obvious suggestions but the conditions need to be right. Make sure the table is well positioned to keep birds safe from predators and away from any areas where predatory birds could be hiding. Protect lawn areas and allow them to thrive but also consider leaving an area uncultivated to attract insects. Choose bird-friendly plants – trees can offer both accommodation and food to birds so think about making these accessible or adding them to your garden. Fruit trees and berry trees will provide welcome sources of food. Climbing plants on the walls will give birds a place to hide as well as brighten up the garden, while insect-friendly plants will also encourage the garden eco-system to flourish. A bird bath will give birds another reason to visit your garden by offering them a place to have a bath and access clean drinking water. It is also important to remember to protect smaller garden birds from larger birds that are commonly seen as pests, such as pigeons. Blackbirds, squirrels and seagulls can also be problematic for garden birds – and your attempts to attract them. To deter pests, such as pigeons and rats, keep food off the floor and on a food table and remember to clear up the area around it regularly. 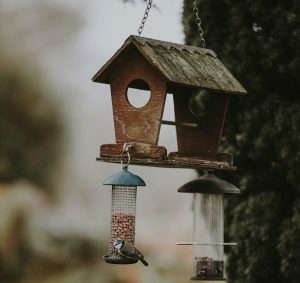 Also use a bird feeder that has a protective mesh to deter pigeons and squirrels. Should you experience a problem with pest birds contact Total Bird Control.